Please advise inexpensive gimbal for BMCC and BMPC. Handled gimbal (like Ronin) and with the possibility install it for multicopters (with converter kit). What do you think - will it work? I'm currently using EAGLE EYE gimbal with my BMPC4K. But I had to upgrade it myself. Cinema camera is too large for this gimbal and it will not fit on the standard mount of EAGLE EYE. So you'll have to make some modifications. Other part is YAW motor is too small for this weight. Had to change is to more powerful one. Please tell me what a new motor you use? And how you change mount? Other parts of this EAGLE EYE work good? For this gimbal I need add only battery with cables? PS You not from Russia? we are using the DJI-Ronin with the BMD Pocket at the Moment, but we have ordered the BMPC 4K and are going to test it at the end of the week. I´ll post some resuts then. I have a Letus Helix myself, and it's been serving me extremely well, mostly with a BMCC. I haven't tried running a Pocket cinema camera on it yet, but I'm sure it would handle the much lighter camera just fine also. It's quite a bit more compact than a Ronin, and noticeably lighter, but the Ronin is probably still the best value in a gimbal currently available, given that its price includes a case, joystick, stand, and so on... basically everything you need for dual operator use besides a wireless transmitter... which is what the Moza is apparently banking on as a way to break into the field. That one looks promising, but I haven't seen reviews of it yet. 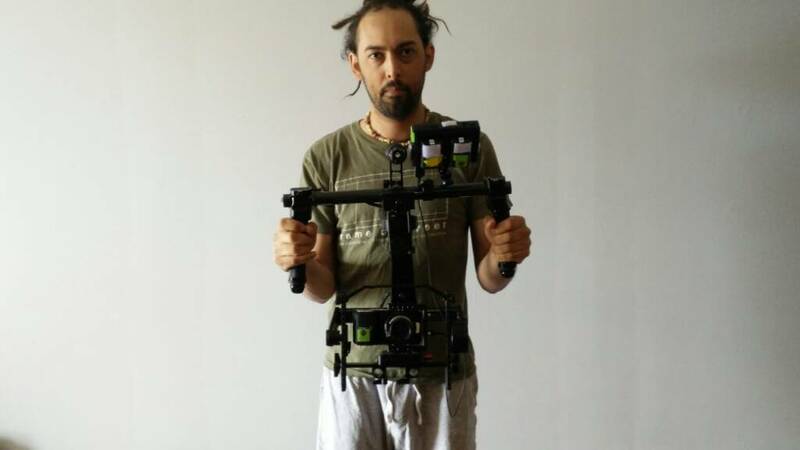 Yes Rakesh, you are right: the Ronin is quit a heavy tools especially for the Pocket Cinema Camera, but the intention was always to buy a gimbal, that can handle a lot heavier cameras too. Besides our Pocket setup is not a light as you might think: Cage, lens, follow focus, hyperdeck shuttle, teradek clip, V-mount plate and battery sum up. Using the DJI Ronin this Thursday, filming a scene with quite a lot of fighting. It handles everything BMCC loaded with ext. monitor, follow focus and sdi wireless transmitters etc. really easily. We're filming all day and it's fun to use with the Altas Support Rig, as there's a version designed for the Ronin. Makes the weight easily managable for a long shoot. Ronin comes with a remote too, means you can have another person precisely controlling the framing. Using the allsteady 5 and it's great for what I need it for. They are just releasing the allsteady 6 which I preordered through kickstarter. Using with my Bmpcc and kowa 8.5mm cmount lens and dp4 monitor. I just received a Came-Mini. It's the first electronic stabiliser I have owned but I'm pleased so far. I have it working with the Pocket Camera, EF Speedbooster and Sigma 8-16. At 2kgs all up it is very easy to handle and it works well. I will be testing it more on the weekend and will report more. justin lovell wrote: Using the allsteady 5 and it's great for what I need it for. They are just releasing the allsteady 6 which I preordered through kickstarter. Using with my Bmpcc and kowa 8.5mm cmount lens and dp4 monitor. Thank you, please tell me - AllSteady-6 is fully compatible with BMCC 2.5k and BMPC 4k ? And what difference between AllSteady-6 and AllSteady-6Pro ? And AllSteady-6 better than Ronin ? Can the AllSteady-6 do briefcase mode (filming along the ground)? Don't think it can. Says payload is 20lb so should easily work with fully loaded BMCC or BMPC and larger cameras. Half the weight of a Ronin is pretty nice. Hi my name is Andrew and I work for Turbo Ace. We make the Allsteady gimbal! Feel free to ask me any questions! Yes the Allsteady 6 can run in briefcase mode! The gimbal uses the popular Alexmos firmware, and we've programmed each gimbal to work in brief case mode, inverted mode, and work with small, medium, and large cameras. We don't want to to have to plug the gimbal into a computer if you don't want to. Right out of the box, the gimbal just works. The Allsteady 6 is compatible with the BMPCC and the BMPC 2.5K and 4K. AndrewConrad wrote: Hi my name is Andrew and I work for Turbo Ace. We make the Allsteady gimbal! Feel free to ask me any questions! 1. Allsteady 6 without any problem working fine with BMCC (2.5K) and BMPC (4K) + wide lens = 2.3 Kg ? 2. I can use INFINITY 6 HEXACOPTER with gimbal Allsteady 6 with this setup BMCC or BMPC + lens = 2.3 Kg ? 3. Why INFINITY 6 better than DJI S1000+ ? 1. The Allsteady 6 can run the BMCC 2.5 and 4k cameras. The only known issue is the limited access to the connections on the side of the camera. The Allsteady 6 tray is wide enough to accommodate these cameras, but with certain lenses the camera may be mounted in such a way that these connections can be sitting right up against the vertical tilt axis support bar. Longer heavier lenses may counter balance the camera enough to push the BMPC back far enough in the tray to give access to these connections. More testing is required. 2. The Infinity 6 hexacopter would be a great option for the BMPC even with the heavy lens. The BMCC 2.5k or 4k is reaching the upper limits of the weight limits of the hexacopter. The Infinity 9 octocopter would be a better option for this large of a camera. 3. The Infinity 6's main advantage over the DJI products is the possibility of heavy customization to fit your exact needs. The DJI Zenmuse gimbals are very limited with their camera and lens selections. The Infinity 6 and Allsteady 5 combination let's you fly anything from the BMPC, Sony A6000, or GH4 up to a fully loaded Canon 5D. It can also accommodate a large selection of lenses with these cameras, and load outs can be changed in 30 minutes or less with minimal tools. (not small BMPCC 1080!) + wide lens about 600g - Total 2.3kg? Or not? The Infinity 9 (15k!+) too expensive for me. Seems that the Ronin-M isn't designed to be used with the BMCC 2.5K version. -____- ¿Am I wrong? Reseller: Televisión y Video Digital Ltda. Rafael Molina wrote: Seems that the Ronin-M isn't designed to be used with the BMCC 2.5K version. -____- ¿Am I wrong? I can't seem to find the answer to this either. I saw where they said a stripped down Epic will work but no mention of the BMCC. Well, if an Epic fits there, the BMCC will definitely fit better because the BMCC is less heavier. But we'll need a more solid answer. In my experience and testing the Red without the Redvolt battery, handle grip, and lcd, its only about 5lbs. That was with a 50mm rokinon. The BMCC 4k is near the same exact weight. 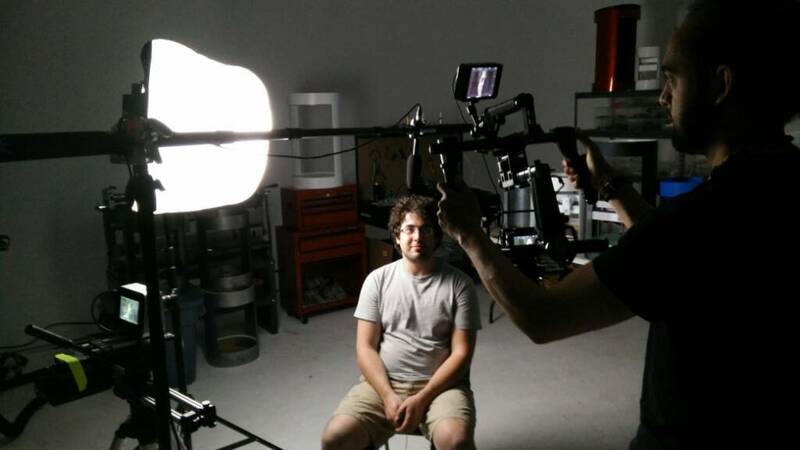 The BMCC is wider, and the Red is more narrow and taller. Mike Poff wrote: In my experience and testing the Red without the Redvolt battery, handle grip, and lcd, its only about 5lbs. That was with a 50mm rokinon. The BMCC 4k is near the same exact weight. The BMCC is wider, and the Red is more narrow and taller. Mike, are you referring to testing the Ronin-M with the Red? The original question was finding a gimbal to use with the BMCC. At some point Rafael said if the Epic fits there, the BMCC definitely will fit. I was clarifying that the two cameras are vastly different in size. A Red stripped down is way more narrow than a BMCC. I was also clarifying that the weight isn't that drastically different. Talking gimbals in general, I bought one of the cheap chinese carbon fiber ones with no motor cages and 5208 motors. I eventually purchased cages and 8017 motors. You can get them cheap now. All total, what you see in the picture is $1040 with dual motors, alexmos, huge strong motors. The gimbal cages are the "WASP'S" There is some DIY but nothing most people can't handle. Manuel Wolf wrote: Hey there! Allsteady-6 pro? Or very heavy, expensive and with a strange mount big Ronin? People say that allsteady have a problems - balance, quality and support? "The only known issue is the limited access to the connections on the side of the camera. The Allsteady 6 tray is wide enough to accommodate these cameras, but with certain lenses the camera may be mounted in such a way that these connections can be sitting right up against the vertical tilt axis support bar. Longer heavier lenses may counter balance the camera enough to push the BMPC back far enough in the tray to give access to these connections. More testing is required." And if I can not use SDI out from BMCC/BMPC in setup with my lens like Samyang, Sigma or Tokina??? How work without external monitor? And how without audio in and remote in? 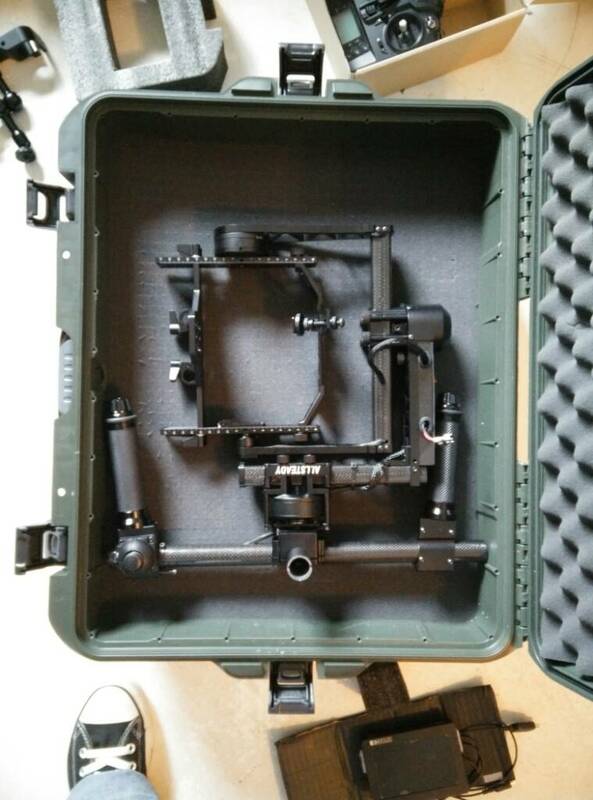 What right gimbal we can buy 1000-2500 usd for use with BMCC/BMPC ? Pavel, I just pre-ordered the Ronin-M and while reading the PDF user manual I noticed DJI list several cameras that have been tested and work with the Ronin-M. And the BMCC is one of them. I hope this helps. It really looks like the Ronins are the way to go right now. Wow! Cool, but not BMPC 4k ? Maybe soon will Arm Extensions for Ronin-M like for Ronin ? Timothy Cook wrote: Pavel, I just pre-ordered the Ronin-M and while reading the PDF user manual I noticed DJI list several cameras that have been tested and work with the Ronin-M. And the BMCC is one of them. AS far as value goes in gimbals, Ronin is a clear winner. Even though I prefer my Helix because it's smaller, lighter, and more ergonomic than a Ronin, it's also more than twice as expensive. Before picking a Ronin M over a Ronin though, make sure that the M has enough load capacity to handle additional stuff like follow focus and that sort of thing, because you'll need them (which is true for any gimbal). Thanks Rakesh I'll keep that in-mind. I've pretty much just squeaked by with funds on getting the M version, and so far all I use is the pocket and will add the Micro when it comes out. So I'm staying fairly small with my gear. I do hope to one day own the Mini but it and the gear needed is just out of my budget. Saying that I'm pretty sure the Mini with out the handle will fit the Ronin M.
What I shoot, where I shoot, and the shots I'm planning in my head will all benefit from having a good motorized gimbal. This for me right now is the main piece of equipment that will help my production value step up to the next level. And Just like I was with Blackmagic Design giving us compact affordable raw, I'm super grateful for DJI giving us high quality, user friendly, gimbals at a affordable cost. Timothy Cook wrote: Thanks Rakesh I'll keep that in-mind. I've pretty much just squeaked by with funds on getting the M version, and so far all I use is the pocket and will add the Micro when it comes out. So I'm staying fairly small with my gear. I do hope to one day own the Mini but it and the gear needed is just out of my budget. For the pocket and Micro, you should have nothing to worry about, even accounting for follow focus and wireless monitoring, should you need them. Agreed. It's still not a magic bullet, but a gimbal costs less than a steadicam with comparable load capacity, and allows you to do a lot of things that a steadicam enables like tracking/follow shots without requiring dolly + tracks, and some things that steadicams don't work for, like handoffs. Well, at least at page 12 of the manual you can see that they have tested the BMCC on the Ronin M.
¿How did they fit the camera in that width, something missing with the real measurements? I mean, the no brainer is going with the Ronin at once, but the Ronin M cost less, you know. I'd like to be 100% sure about the Ronin M compatibility with the BMCC and then decide if I can save some bucks, or if it'll be better to save more for the Ronin, which I really prefer because you can place a variety of cameras and not worrying about the load capacity; It's just a budget matter. Who are testing it with the bmpc and it seems to work. On the specifications of the brand, they claim to support Bmcc Bmpc and Bmpcc with even the rec/stop function available. I tink its a good option in term of price too. Could be nice to have some feedbacks on that brand and maybe on that specific product.